‘Nerves’ became a highly eligible illness in early Georgian London and Bath. What Freud was for Vienna at the end of the nineteenth-century, George Cheyne was for eighteenth-century fashionable ailments. The English Malady was one of the best known and most influential books of the Georgian age, dealing with what we would now call psychiatric disorders. Such disorders, he contended, should be regarded as diseases of ‘civilization’ and the product of the pressures and affluence of modern life. By making ‘neurosis’ acceptable, even fashionable, Cheyne’s book assumed considerably wider significance during the Enlightenment. 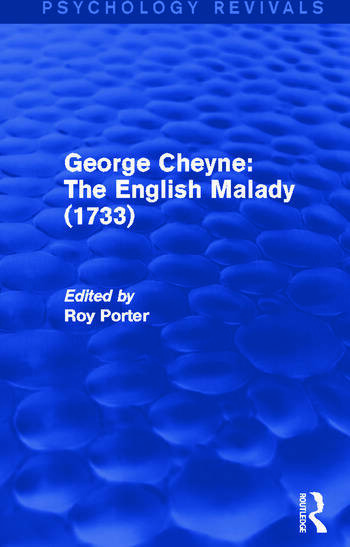 Prefaced by a scholarly introduction by Roy Porter, this reprint edition, originally published in 1991 as part of the Tavistock Classics in the History of Psychiatry series, places Cheyne and his work in the development of British psychiatry.